These items are extremely adjustable and are available in a wide range of sizes. The harness should be placed on the animal with the Dee ring on the center of the back, towards the tail. Available in 1/2", 3/4" and 1" widths. Note the Large and XLarge harnesses have all metal hardware including the side release buckle! 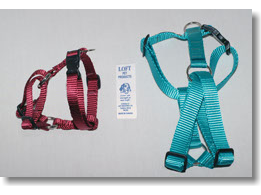 These are a two piece item that consists of a body harness and a tie down strap that is used to securely transport your pet in a motor vehicle and attaches directly to the vehicle's seat belt. Available in BLACK only. 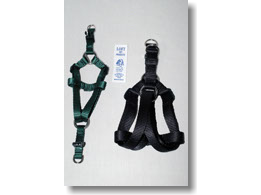 This tracking harness is very comfortable due to its adjustability. Dual side-release buckles at the back make it easy to get on even the most eager of tracking dogs. Wide-open shoulder areas eliminate problems that arise from extended use. Ladder lock tri-glides on the front make adjusting as easy as pulling the straps tight. 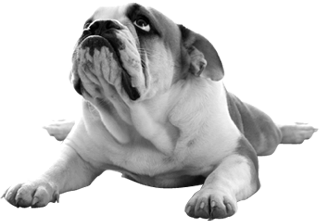 All cut ends are placed away from the dog's skin for maximum comfort. Available in two sizes and various colors.